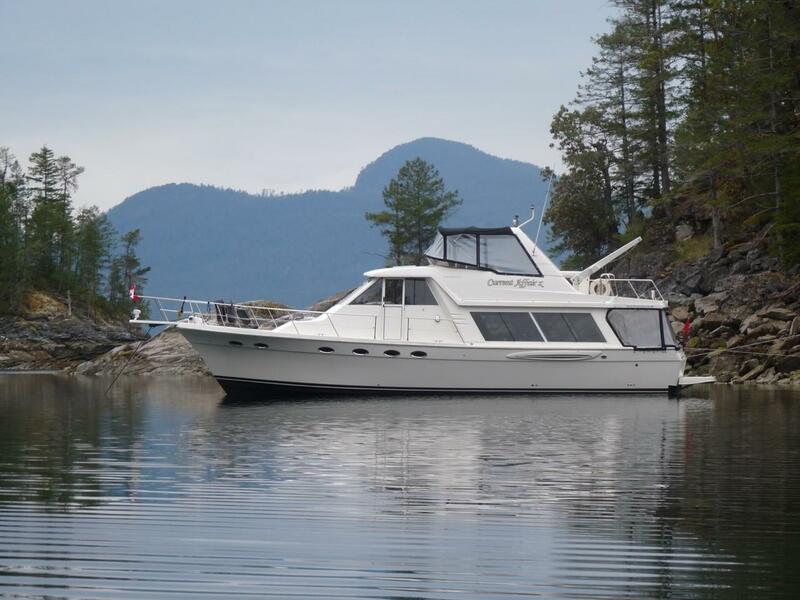 The Meridian 49 Pilothouse is a renown design, comfortable and intuitive layout, superb use of space, and is wonderfully suited to Northwest cruising. 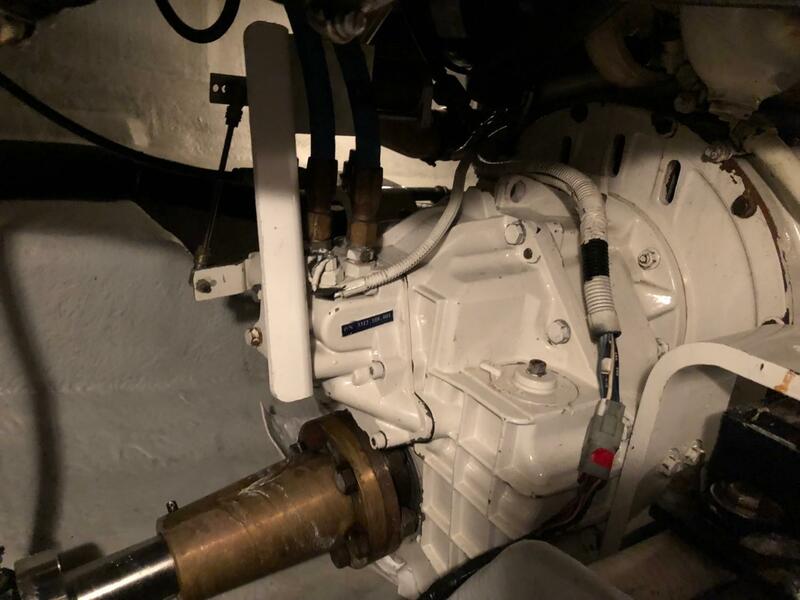 Current Affair X is a one owner boat with a history of good care: solid mechanicals, clean engine room, and generally in nice condition throughout. 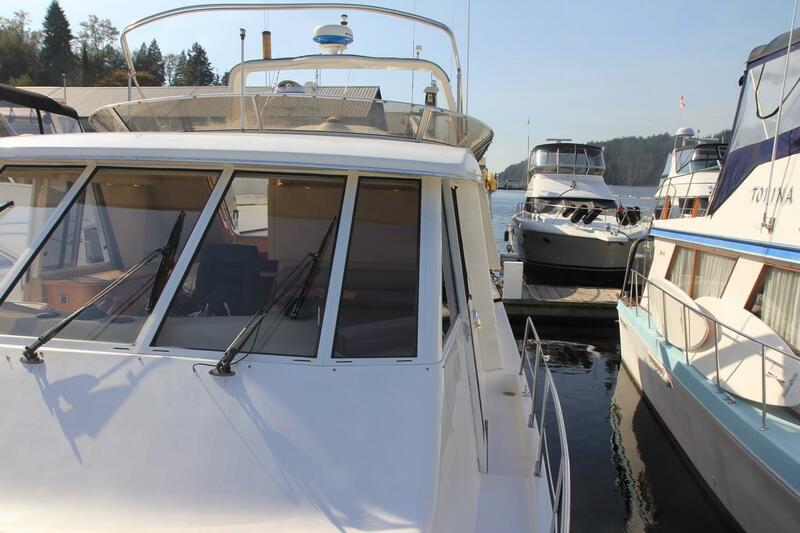 In production from 2003 to 2008, the Meridian 49 Pilothouse is a renown design developed from the Bayliner 4588 Pilothouse of the mid-1980s, and the Bayliner 4788 from 1994 to 2002. 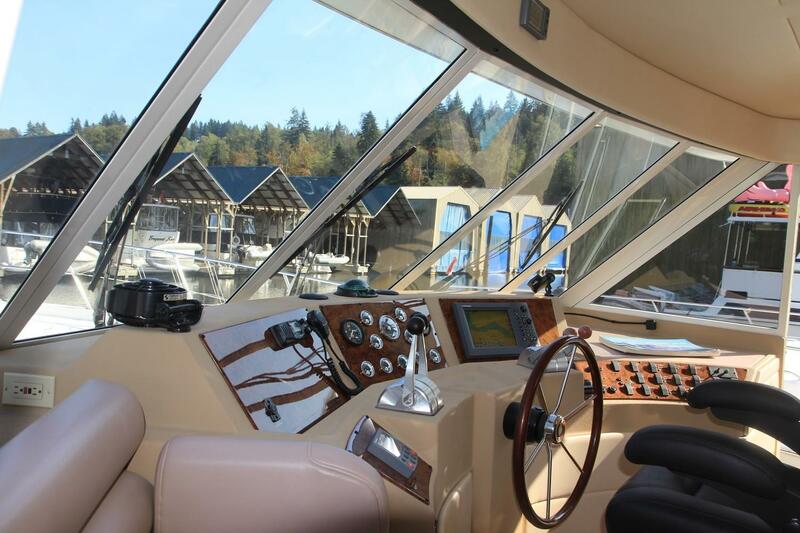 Owners enjoy a comfortable and intuitive layout, superb use of space, windows all around for sweeping vistas, and the pilothouse configuration is wonderfully suited to Northwest cruising. 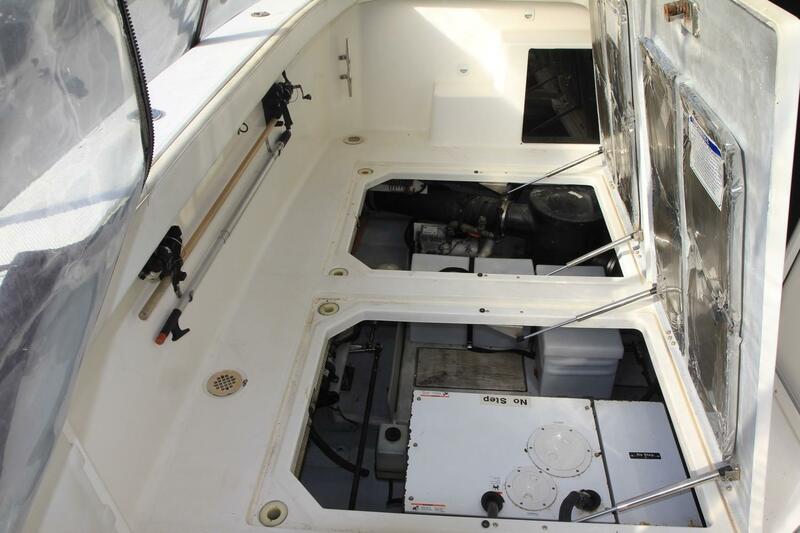 Current Affair X is a one owner boat, with owners dedicated to maintenance. 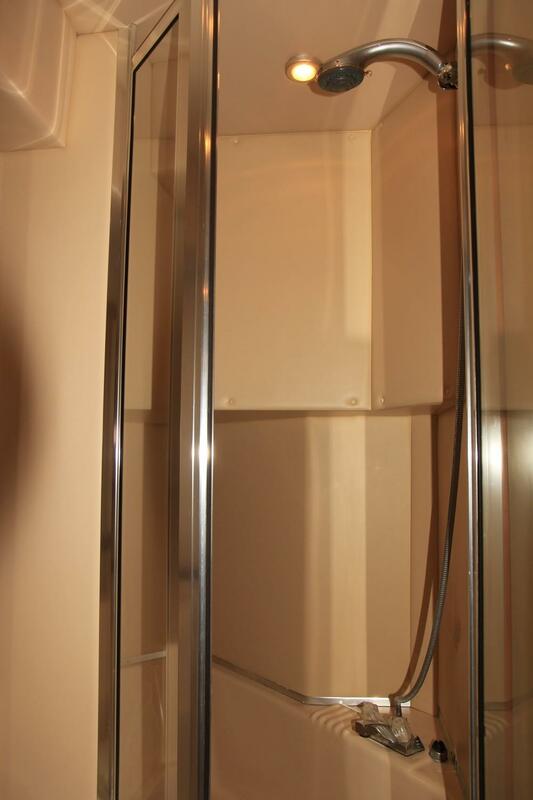 She has a history of good care with solid mechanicals, and generally she is quite nice throughout. 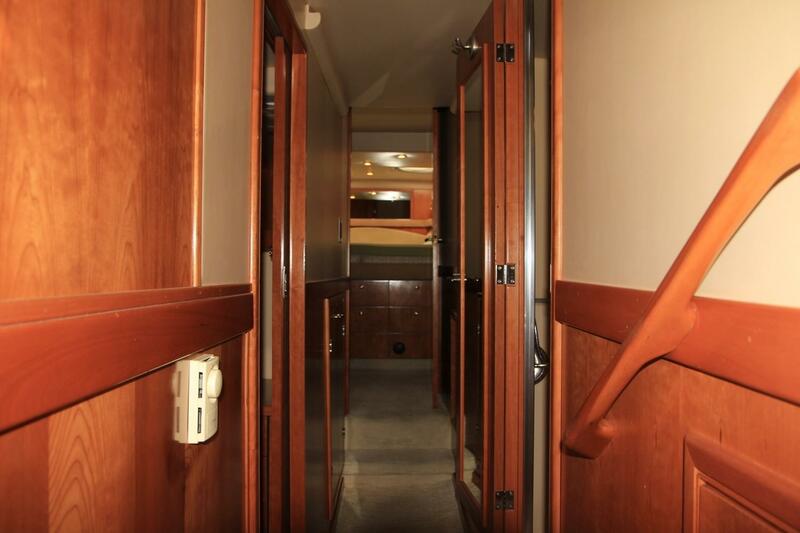 Board through the opening gate from the swim platform to the cockpit. 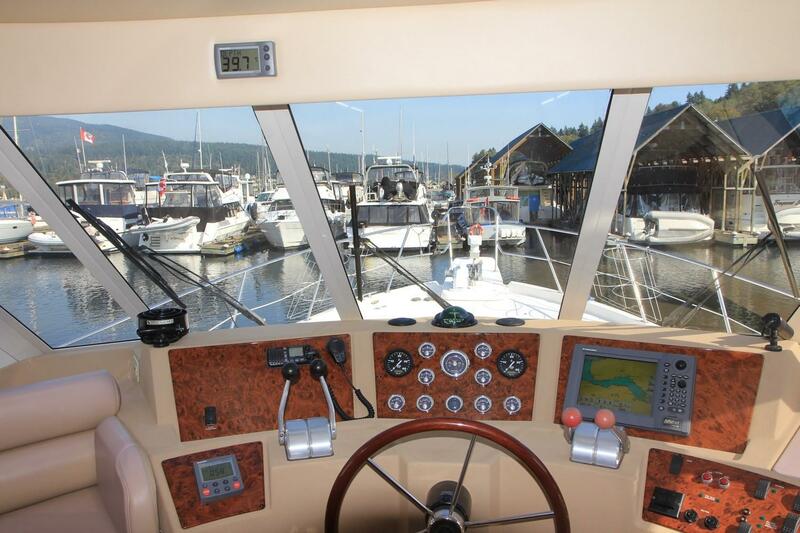 The cockpit can easily be enclosed adding protection during off weather, and generally increases the living space on board. 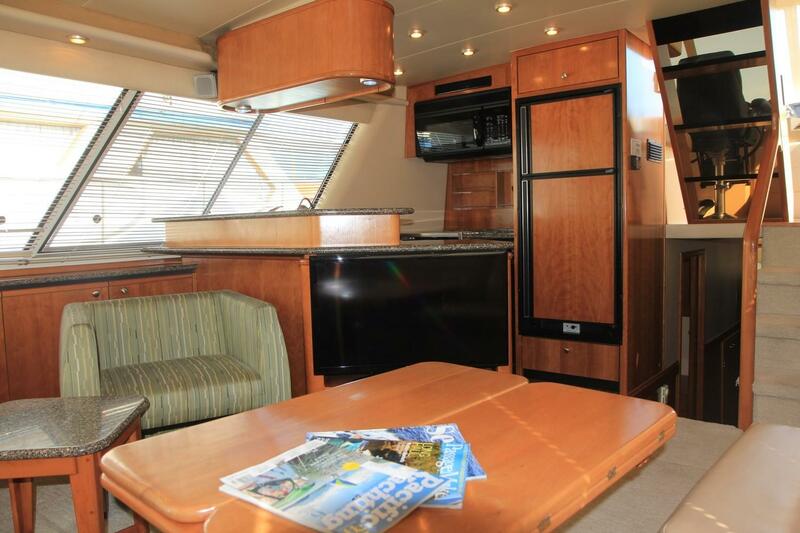 There is room for a table and chairs for your morning coffee, or for fishing as you pause on the way to your next destination. 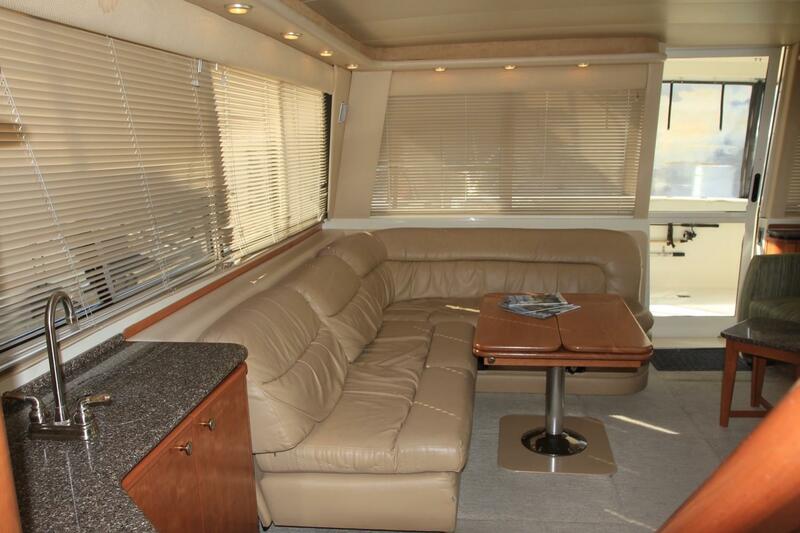 Enter a sliding door to the salon with ample lounging space, windows all around and storage throughout. 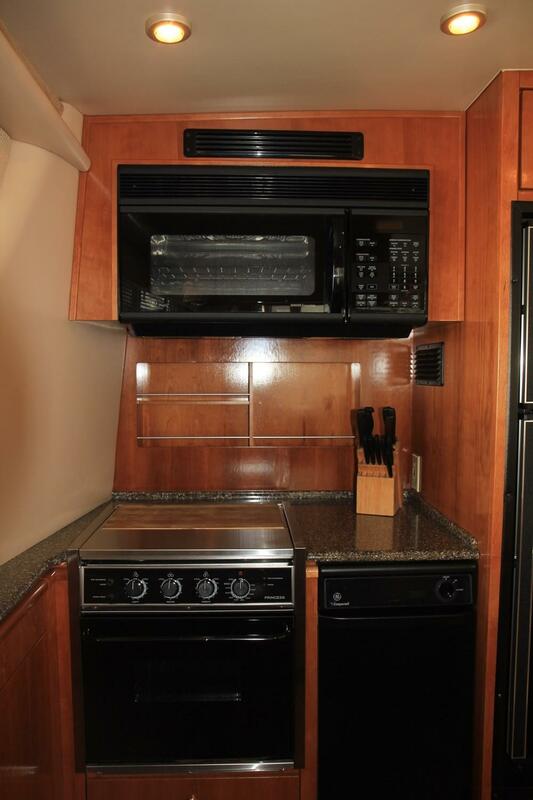 The galley tp port is adjacent to and integrated with the salon keeping cook and guests engaged together. 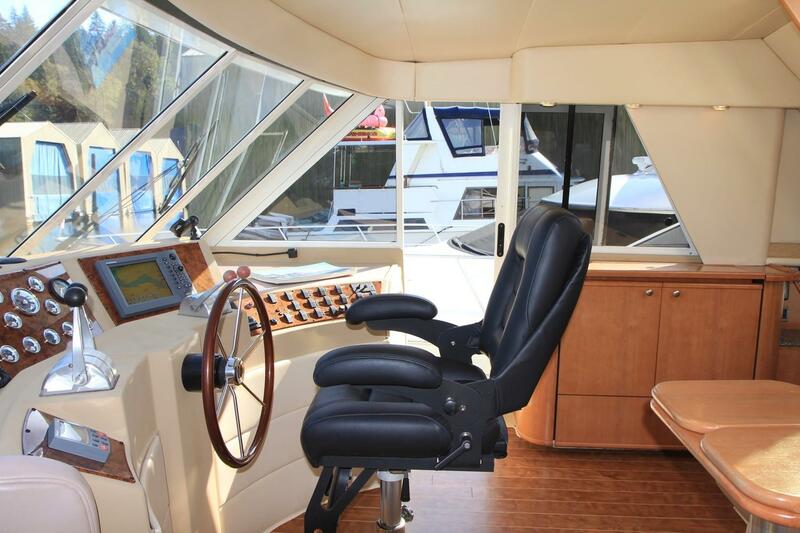 It is fully equipped with the bar to starboard. 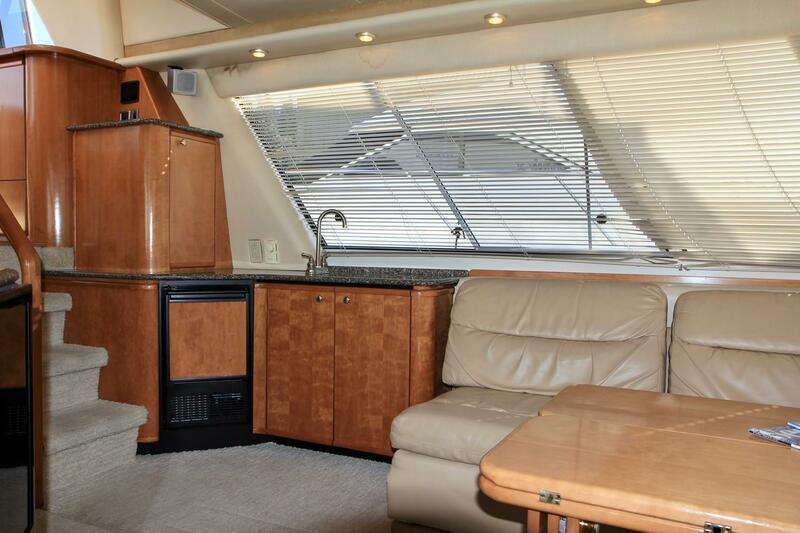 Down four steps to the accommodations area with a guest cabin to port, a guest head with shower stall to starboard, and the owners cabin forward, also with private head and tub/shower. 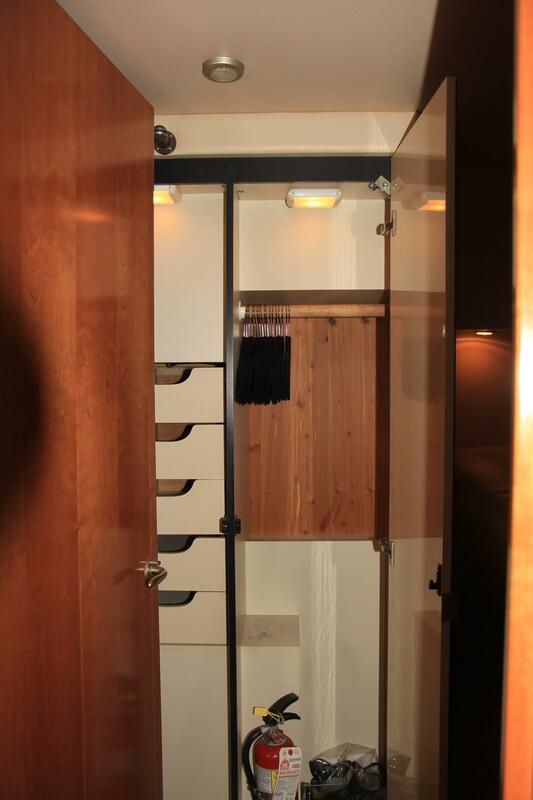 Here too is the laundry and a third cabin adjacent to the owners cabin that can be used as a dressing area, a sitting area, an office, or it can be closed off for privacy, making the third cabin. 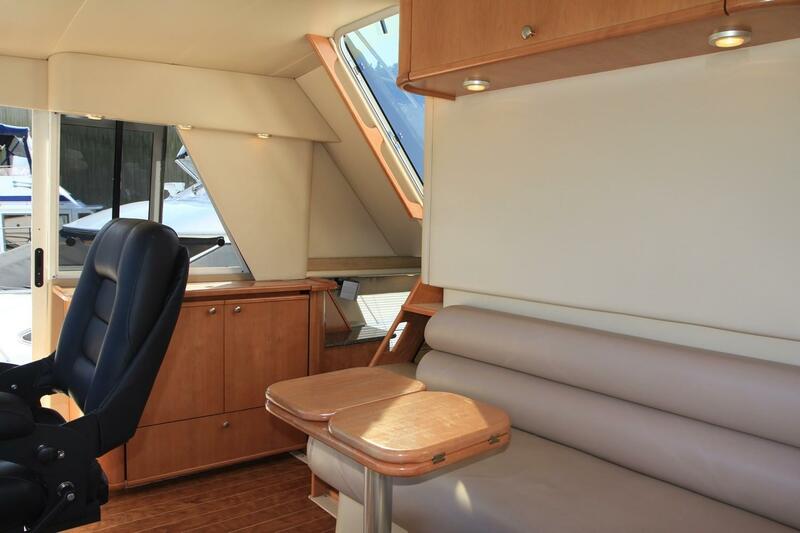 Again from the salon, up four steps to the pilothouse with settee and table, the lower helm, and port and starboard doors to the side decks and foredeck. 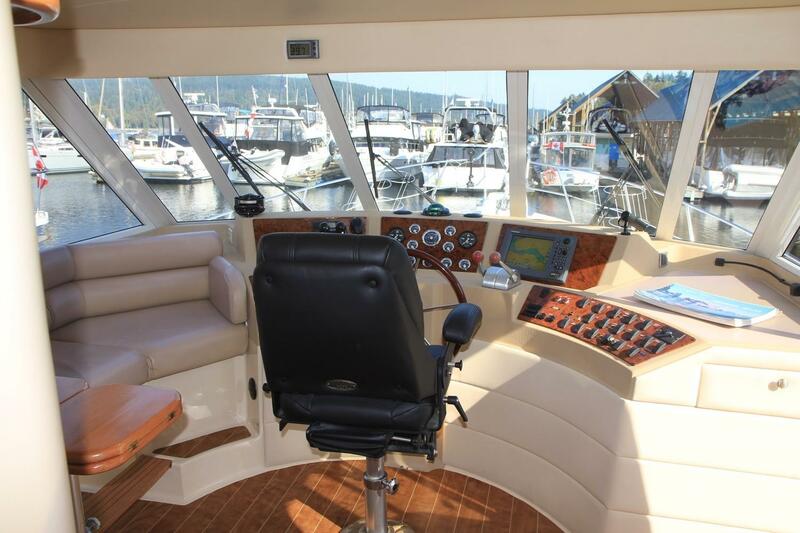 Up a few more stairs to the flybridge with upper helm, plenty of lounging and entertaining space, and the boat deck aft with its ladder back down to the cockpit. 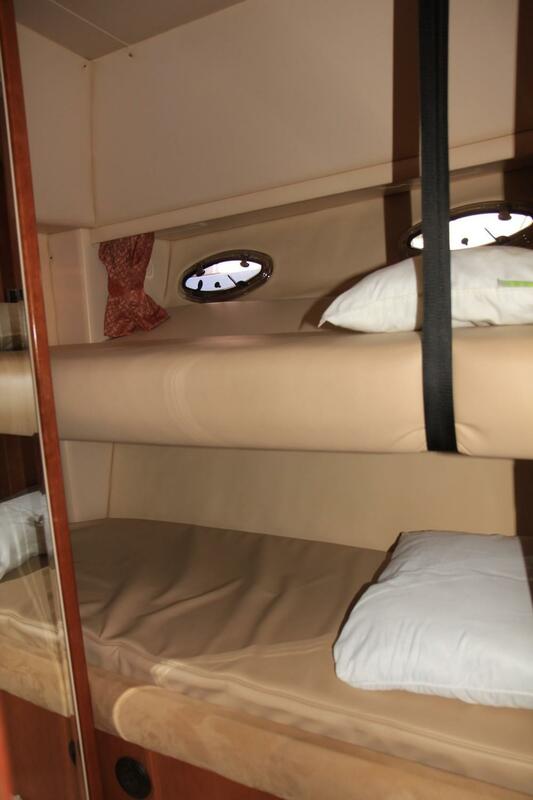 Leading forward from the salon, down four steps is are accommodations in three private cabins with two heads. 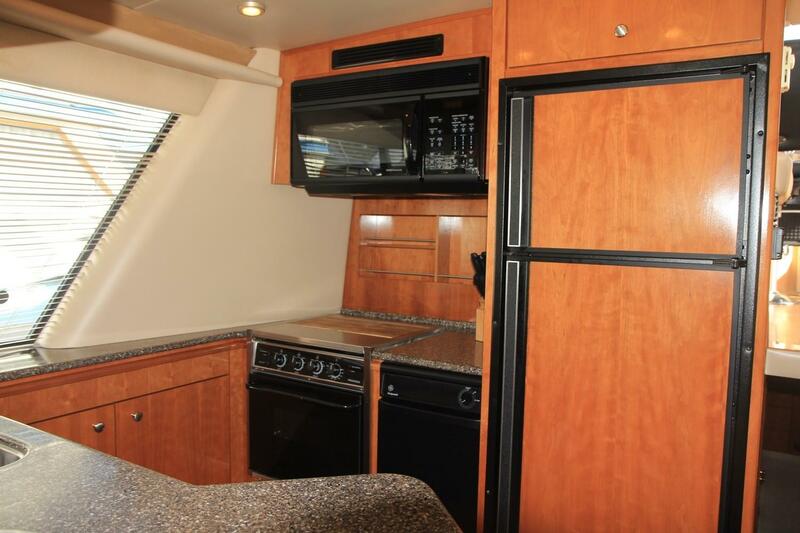 To port is a guest cabin with a double berth, two cedar lined closets, drawers, reading lights, a shelf, two opening ports, two reading lights, overhead lights, and a heater outlet. 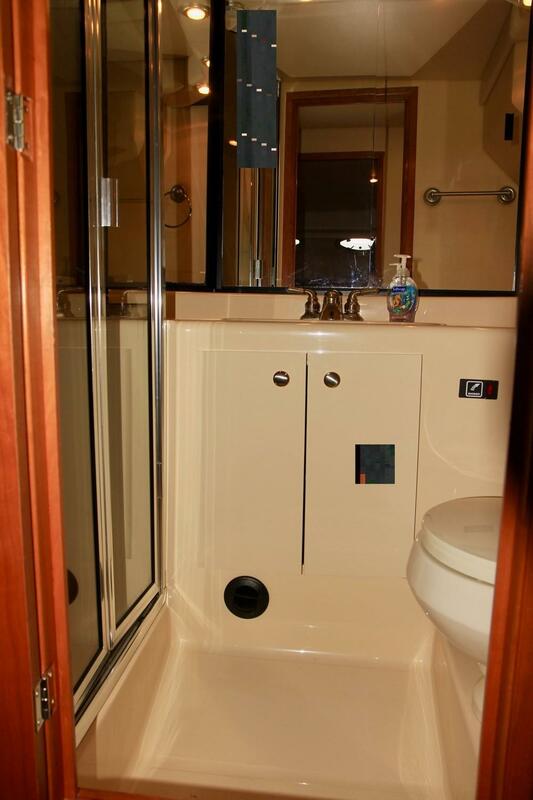 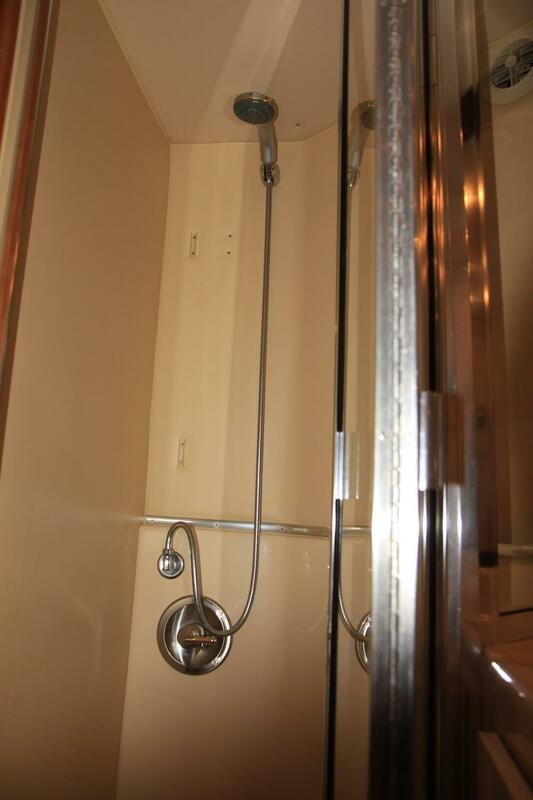 The guest head is to starboard with marine toilet, basin, storage, great lighting, and enclosed shower stall. 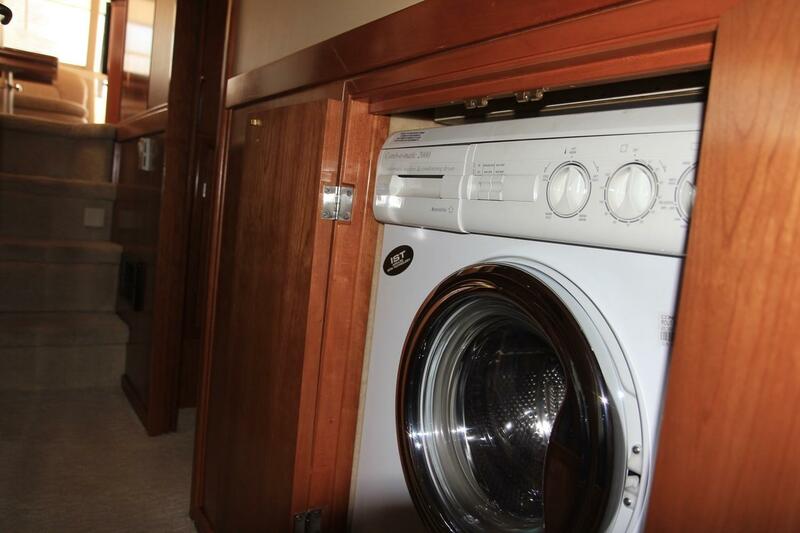 Next forward in the companionway is the laundry with combo washer/dryer. 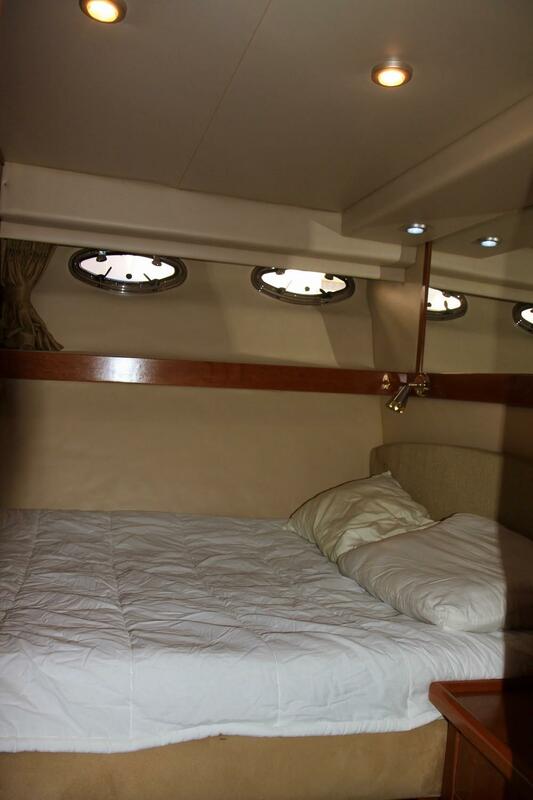 The master cabin is all the way forward with a centreline berth (almost queen size), proper mattress, storage drawers underneath, hanging locker, two reading lights and overhead lights, four opening portlights, opening overhead hatch, shelves, and other cabinets. 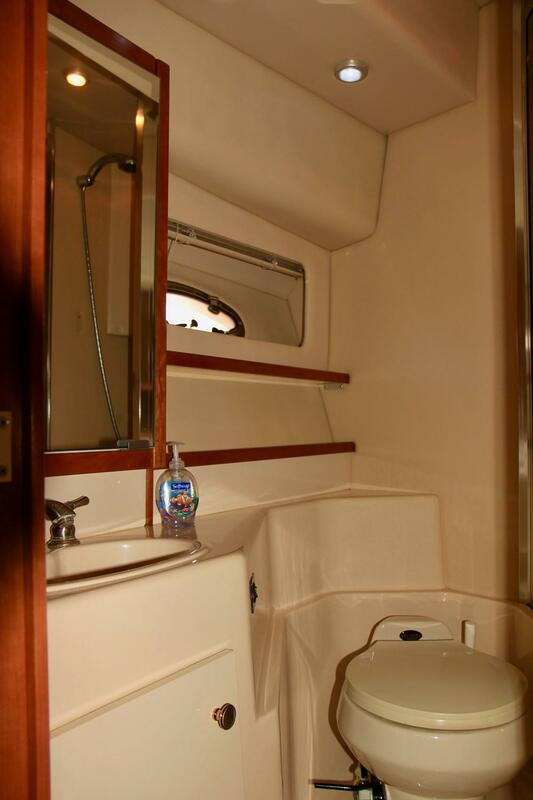 The private master head is ensuite to the cabin with marine toilet, basin, opening portlight, stall shower, and storage lockers. 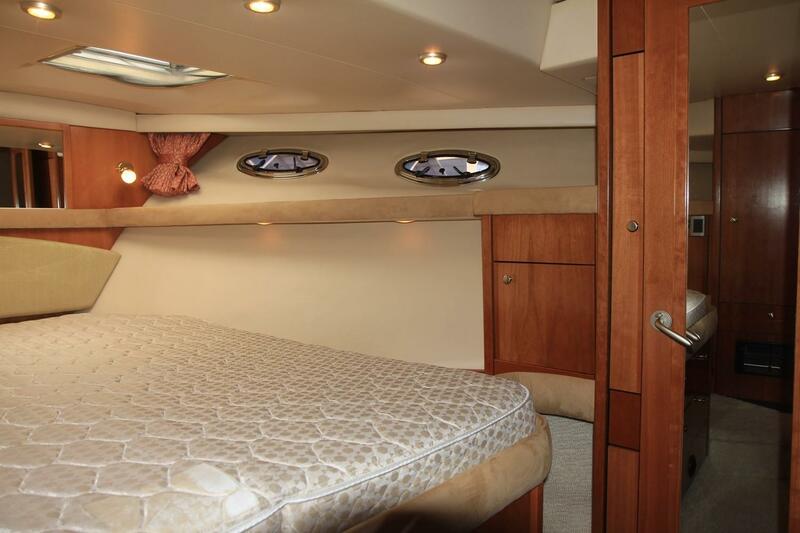 Natural light fills the salon with large windows from the gunwale to the ceiling, with blinds that hide behind the ultra suede valance. 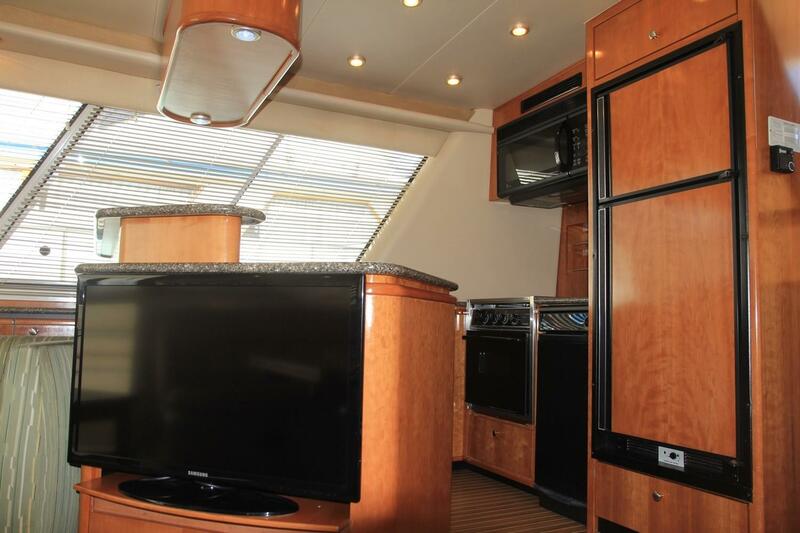 The design’s bright and open salon is a defining benefit of the Meridian 490 pilothouse. 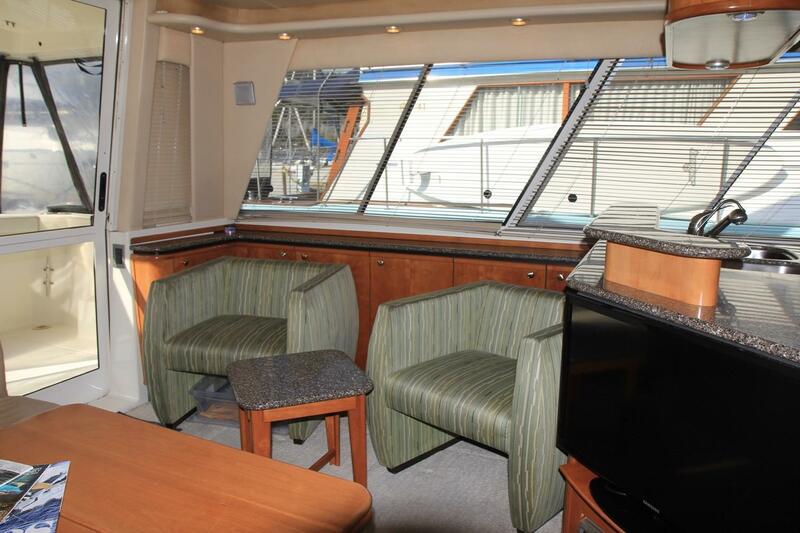 There is a large L-shaped settee to starboard with storage underneath, a hi-lo table, occasional chairs to port, and cabinets all along the port side. 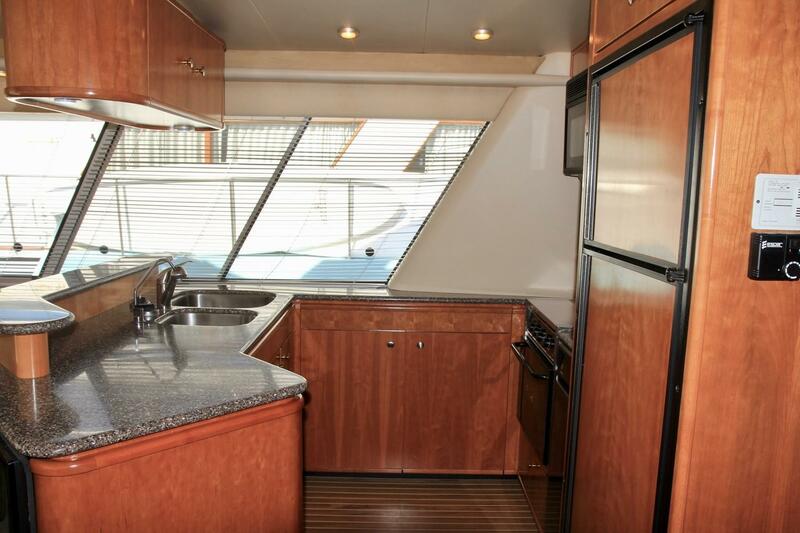 Also along port is a Corian shelf to match the galley. 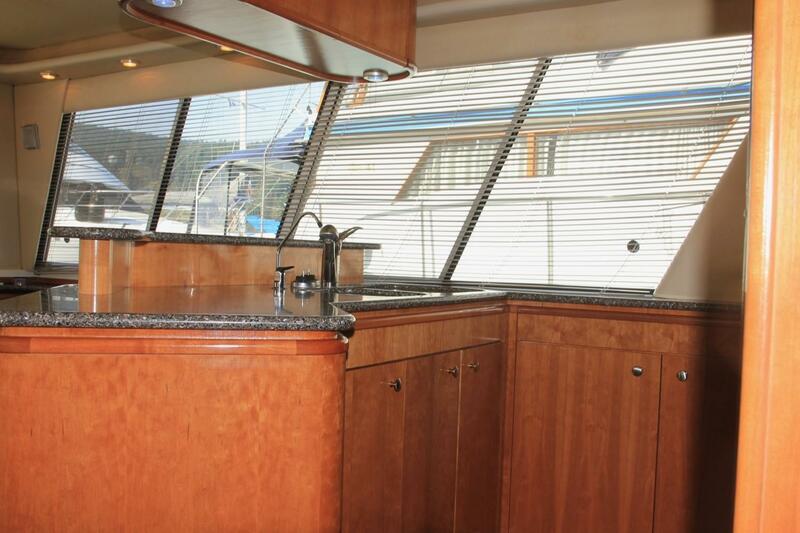 The galley is midships to port, and although a little compact for two, the chef has all the elements needed to create and impress. 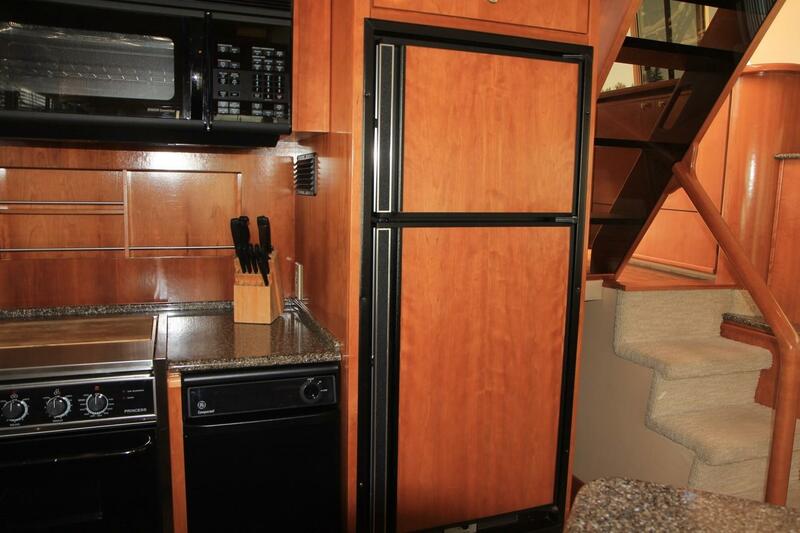 It is adjacent to the salon, with a privacy bar, Corian counter tops, lots of storage in numerous cabinets. 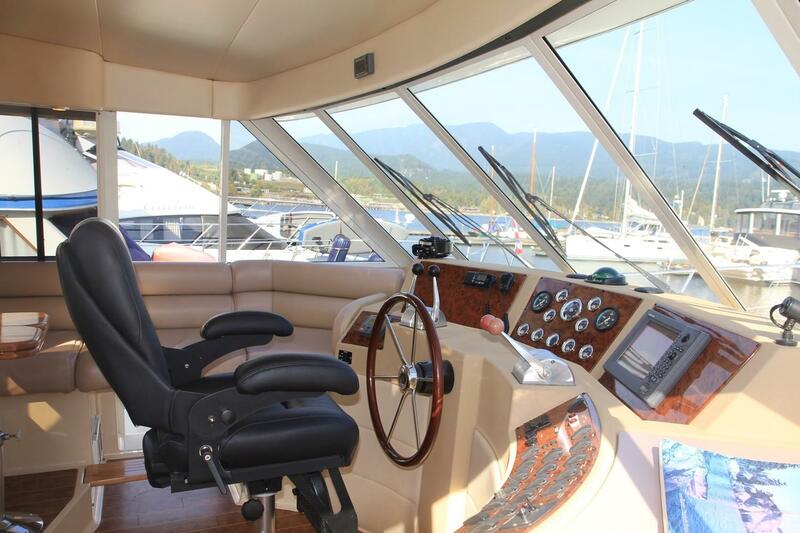 Up from the galley and salon is the pilothouse, the command centre of the vessel. 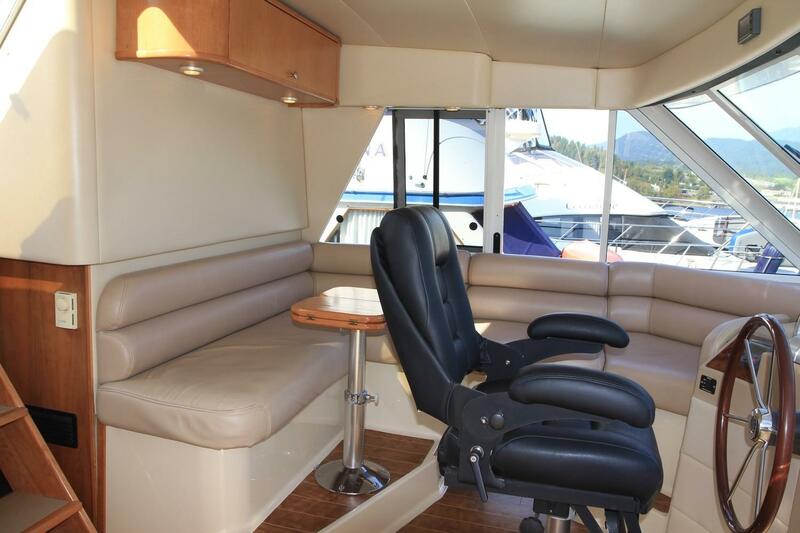 Here is the lower helm-station and seating area offering excellent visibility for operator and guests, with all controls close at hand. 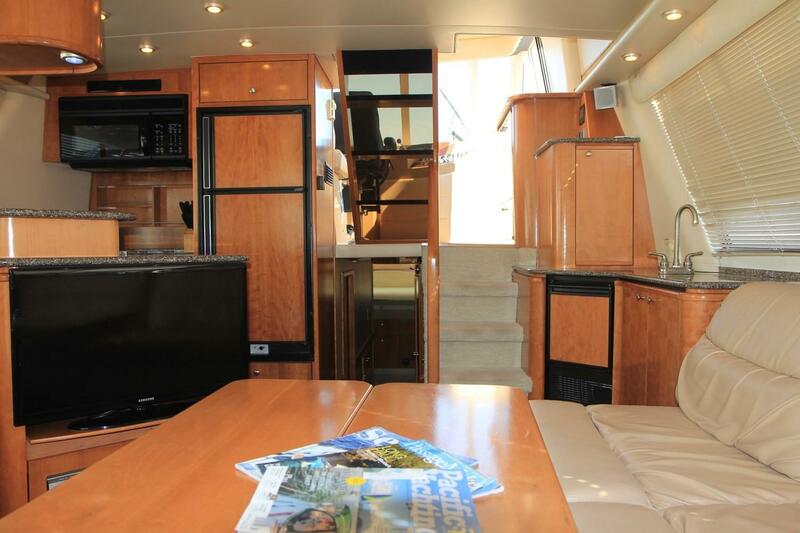 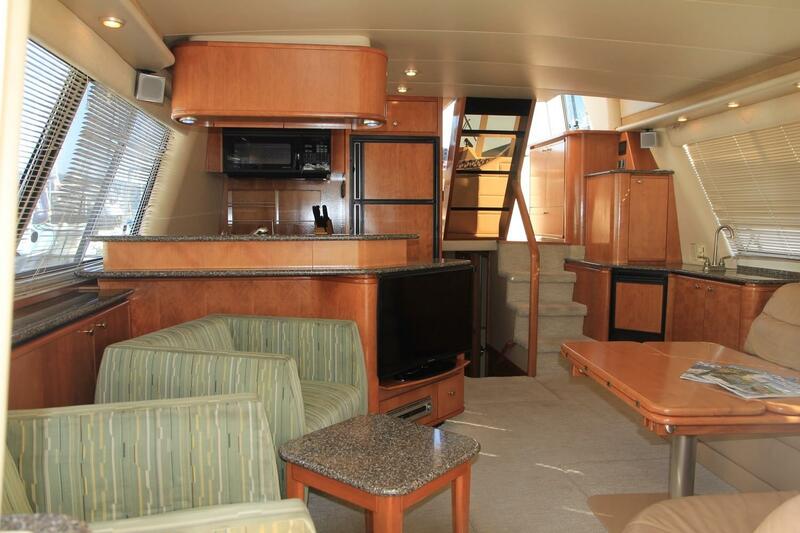 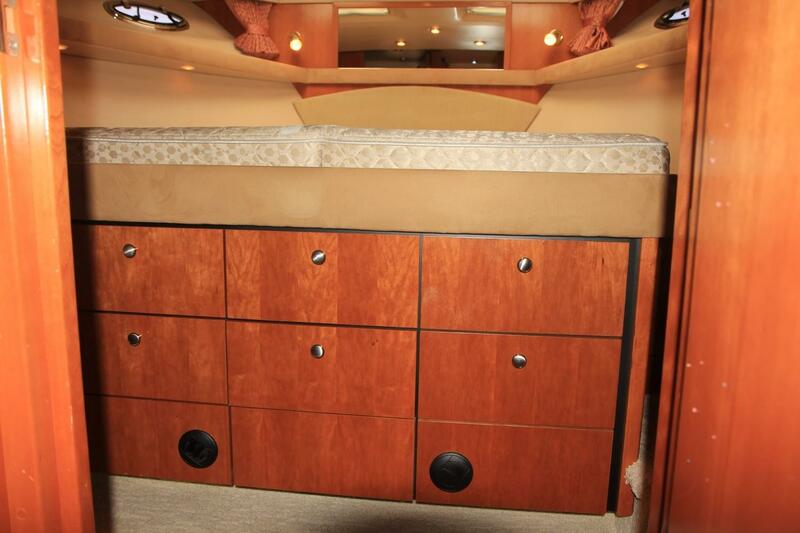 There is a settee and table, storage cabinets, and port and starboard doors to the side decks and foredecks. 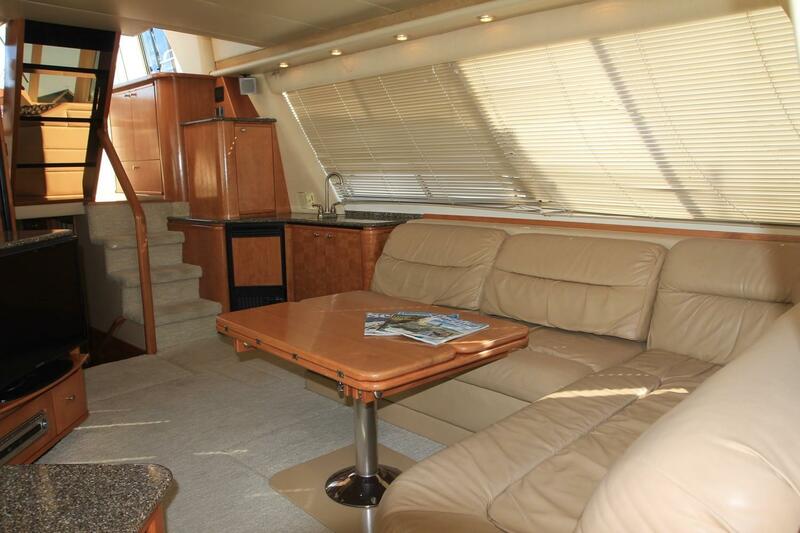 The spacious bridge is often a favourite gathering space whether dockside or underway. 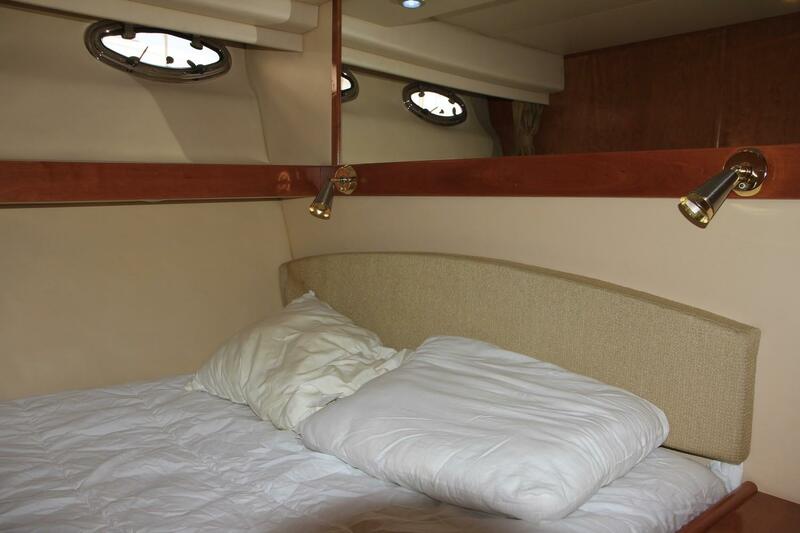 There is seating for a small army in a bench settee to starboard, and an L-settee to port, all with storage under. 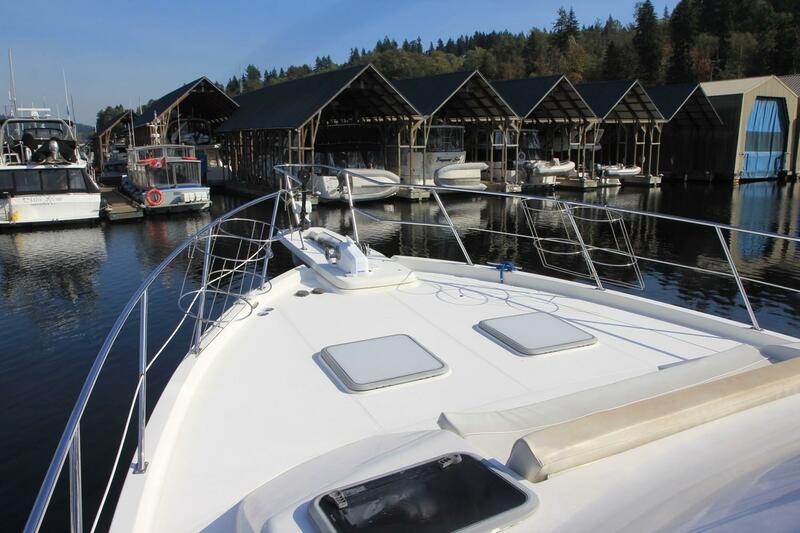 Operator and guests enjoy a sweeping view! 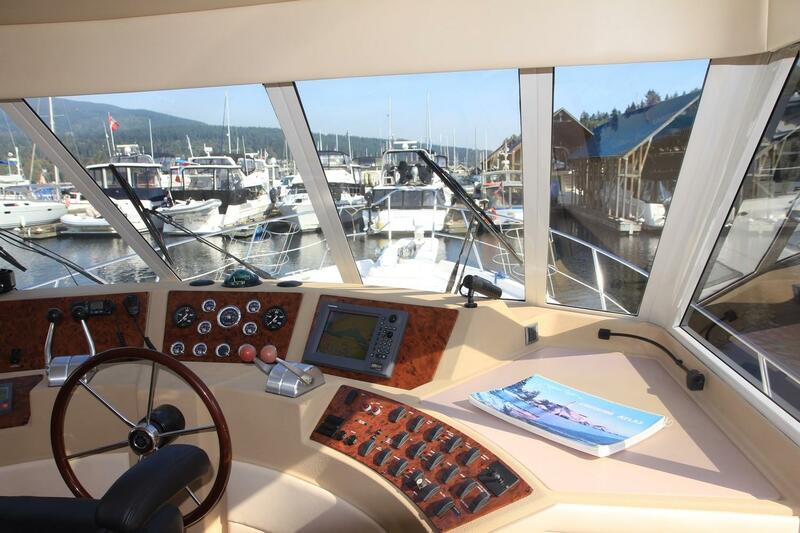 Primary access to the flybridge is via the stairs from the pilothouse, with additional access to or from the cockpit via the ladder aft. 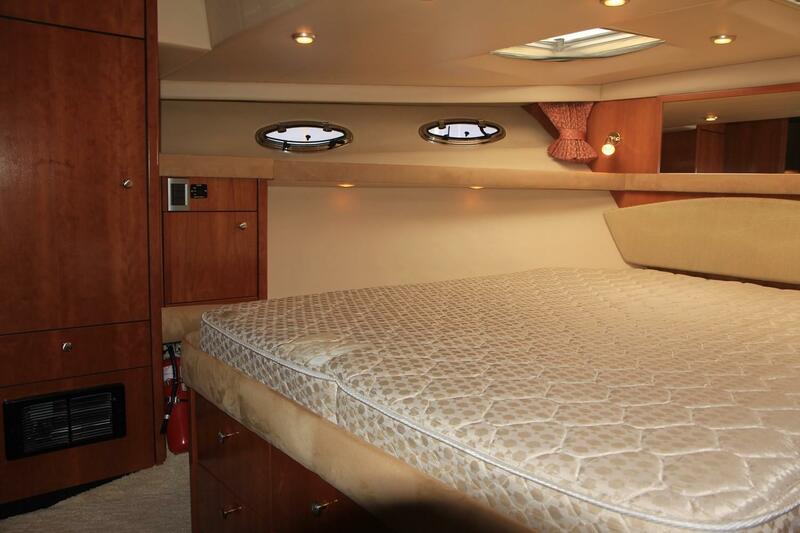 The tender is stored aft of the flybridge on the boat deck and is easily launched with the electric davit. 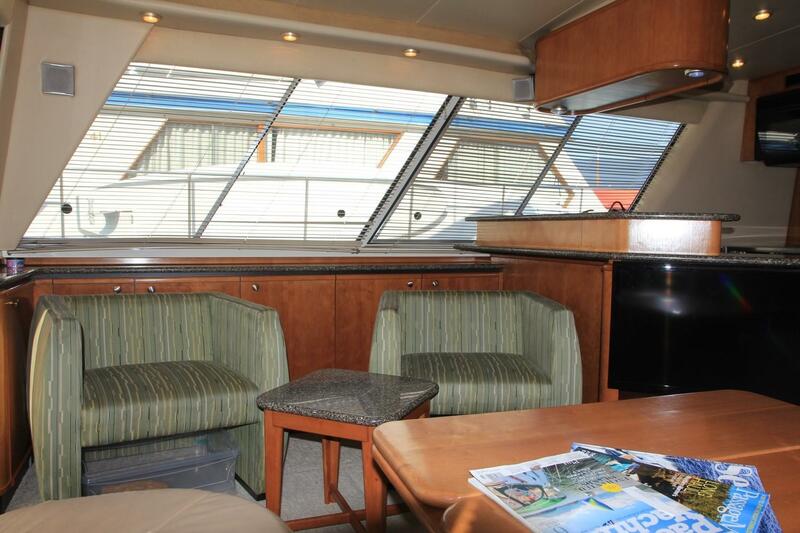 While launched, this area opens up to even more entertaining or lounging space and some owners have added teak chairs and other furniture increasing the use of this space. 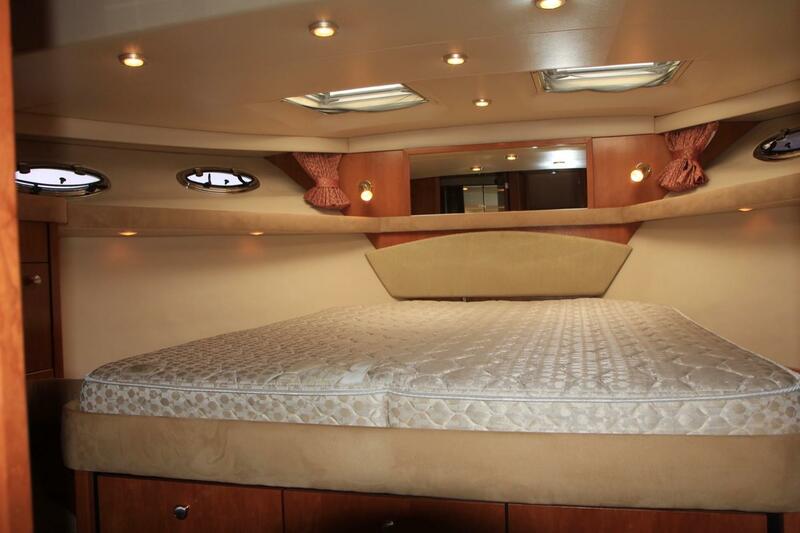 The tender is not included. 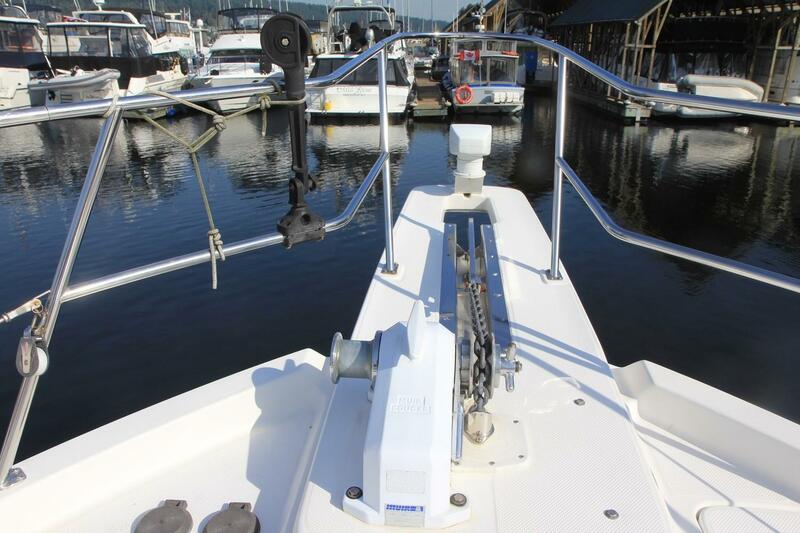 The owners will keep the existing tender for their next boat, and provide that boat’s tender to the purchaser of Current Affair X. 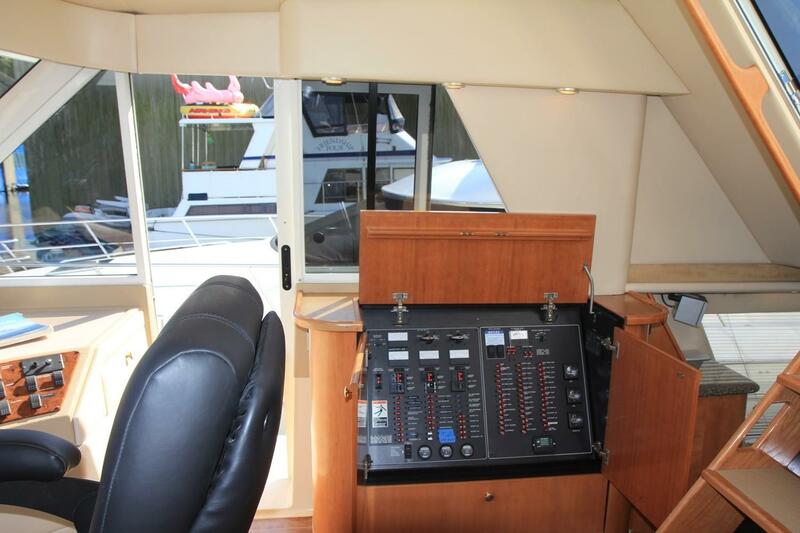 The deep, full width cockpit can be BBQ headquarters, or fishing central, or both at the same time! 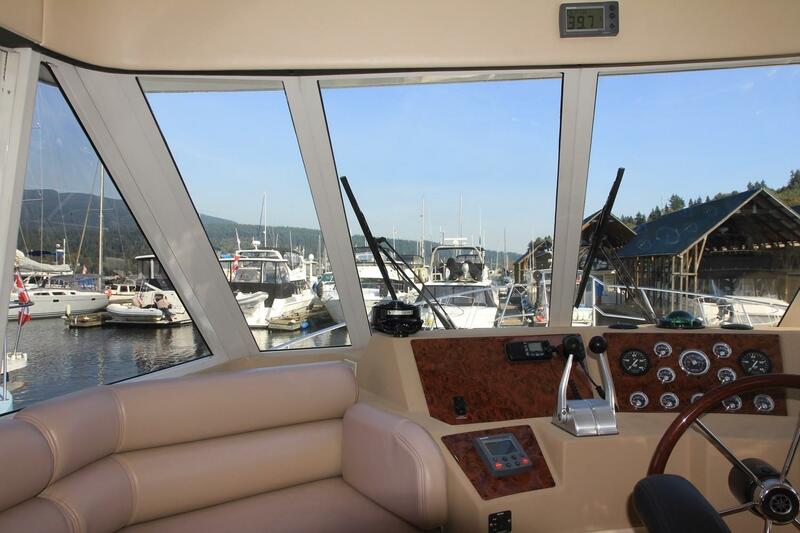 The large transom door allows easy swim-step access to load / unload the tender which is lowered and raised by the power davit on the boat deck above, and also makes for safe and easy dock access. 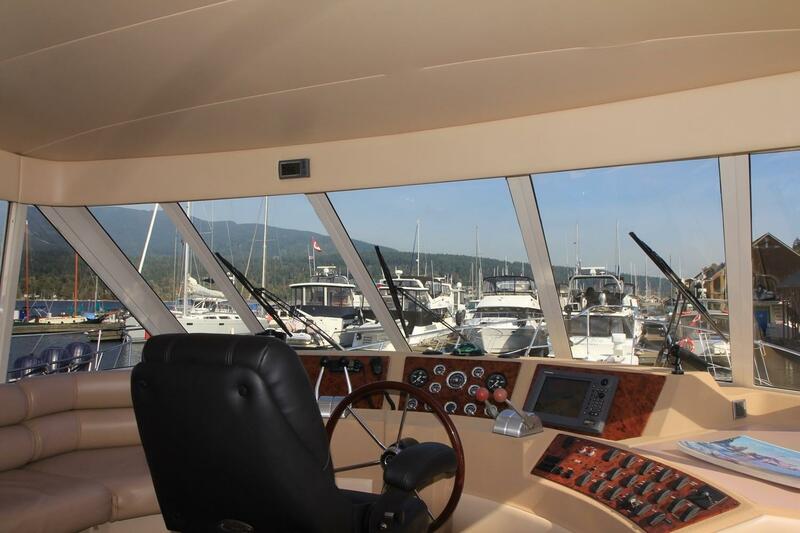 The foredeck is easily accessed from the pilothouse and is protected with a beefy stainless steel railing. 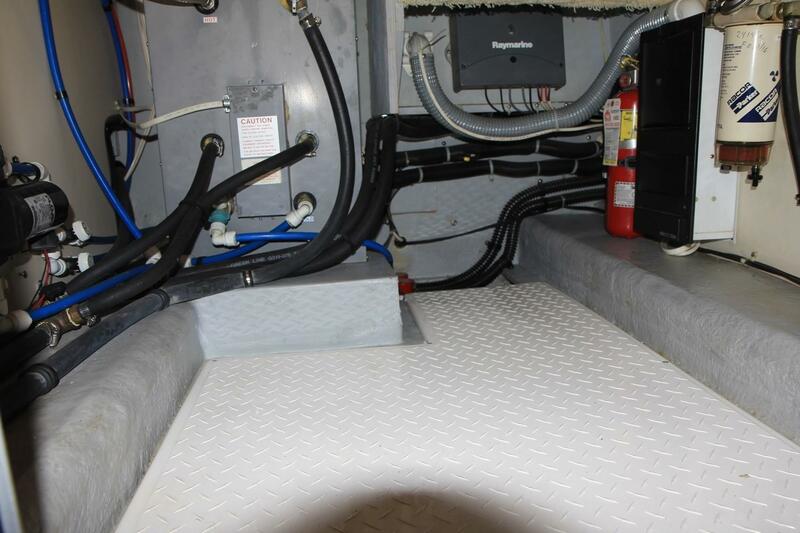 AC and DC power systems service the vessel through circuit breaker panels with appropriate voltage and ampere gauges. 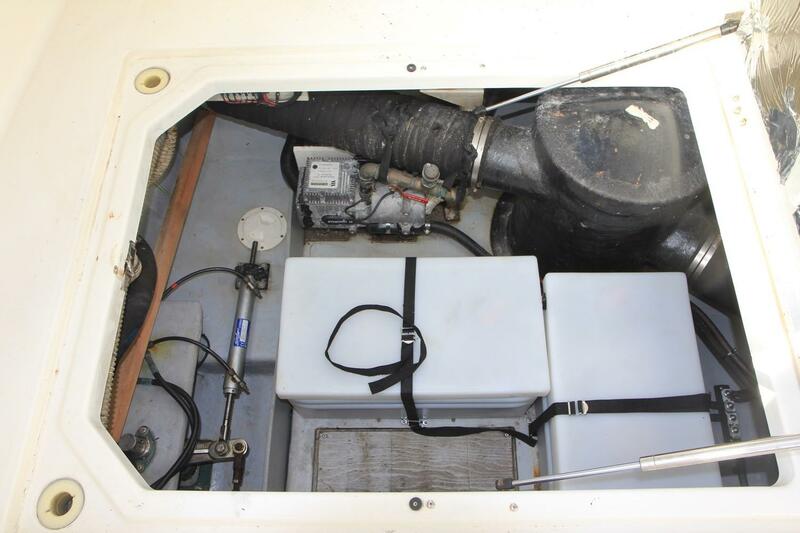 110VAC is provided by two legs of 30 Amp shore connection, by the generator, and, based on available house bank battery power, through the inverter. 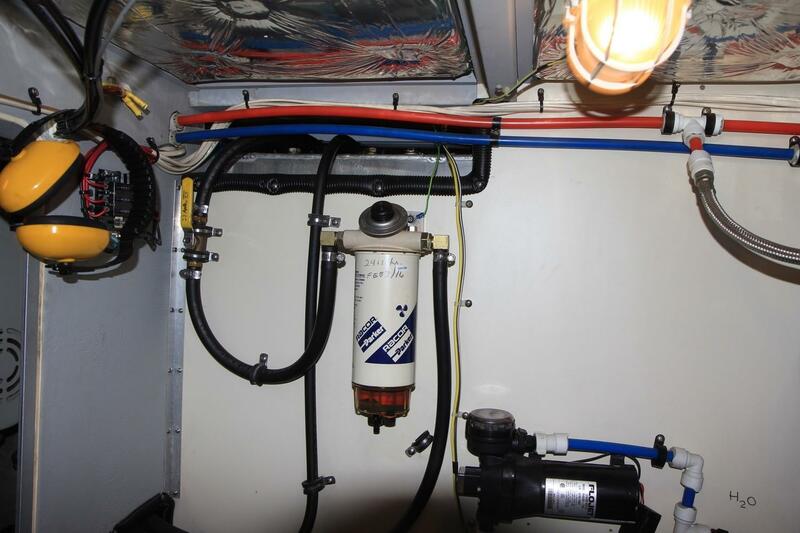 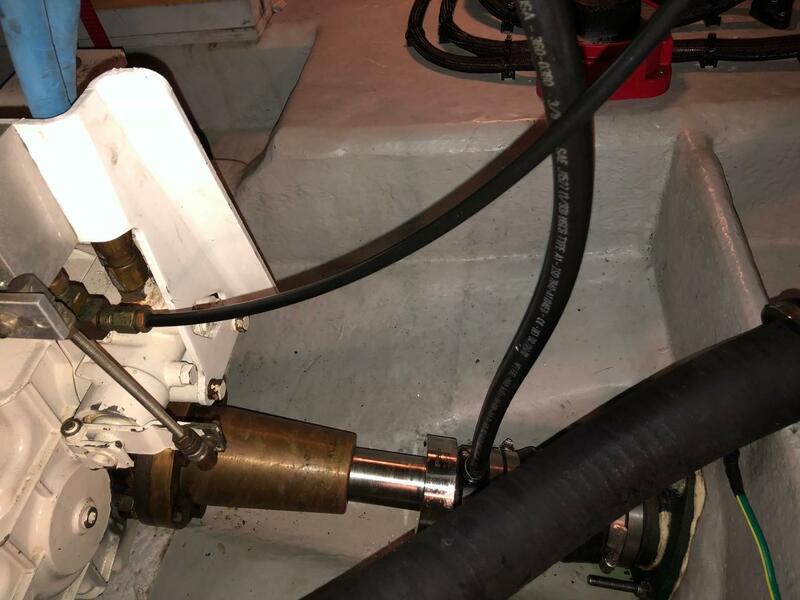 Electrical system updates were done by Bluewater Rigging. 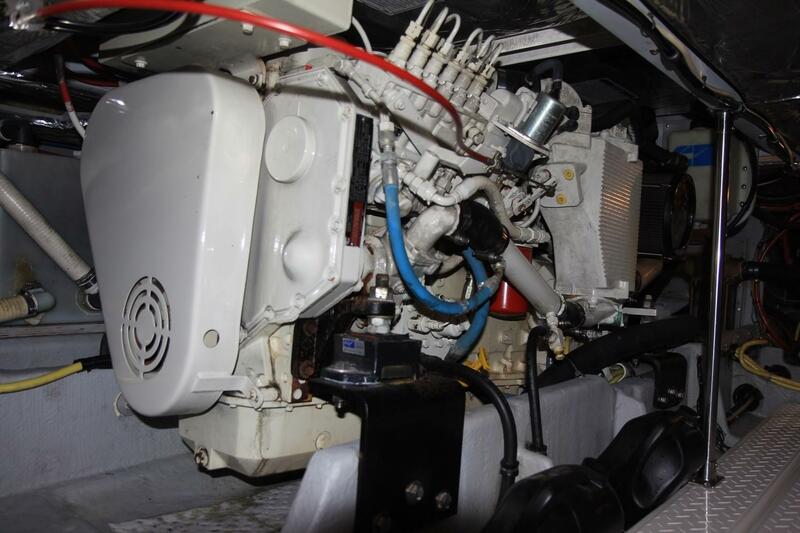 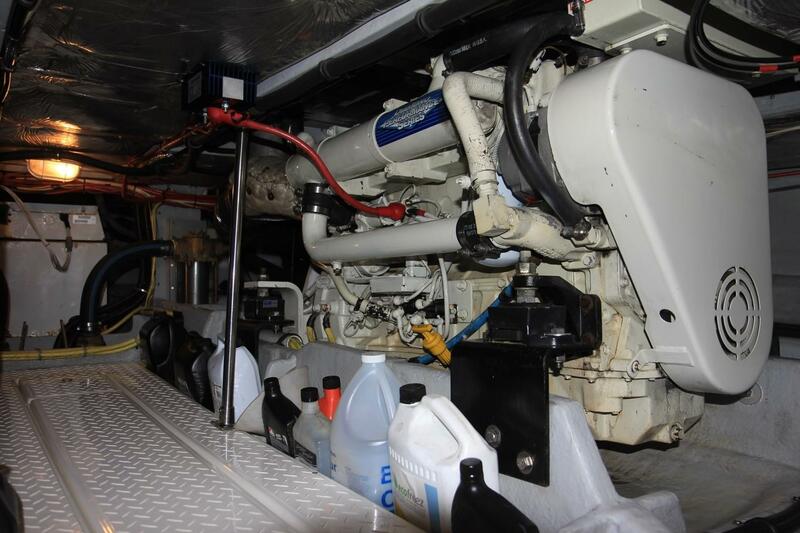 Powered by reliable 330 hp Diamond Series 6BTA85.9M3 Cummins engines, regularly serviced and always ready for cruising. 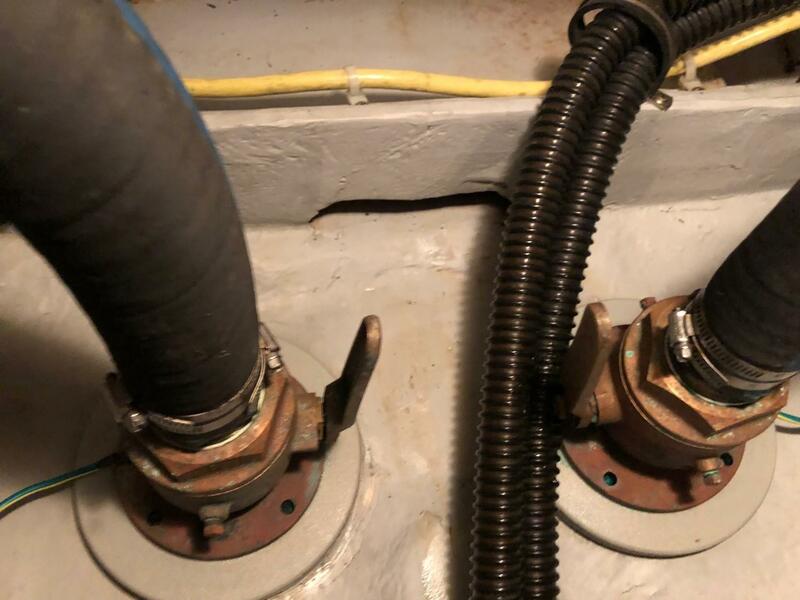 The owners are rightly proud of their boat's mechanical condition. 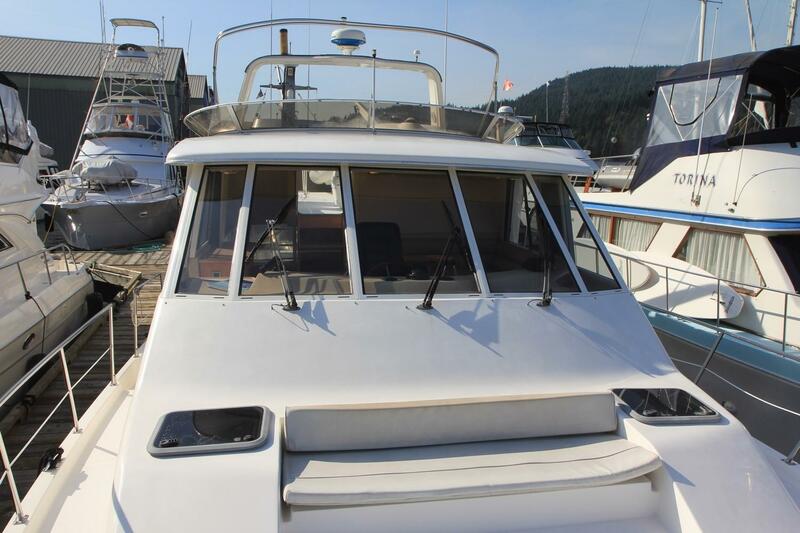 Hi there, I would like more information about the Meridian 490 Pilothouse.